In Adams County, winter storms can be severe. Historically, we can expect at least three winter storms each year according to the National Climatic Data Center (NCDC). These can consist of long periods of sub-degree temperatures, extreme winds and snow causing whiteouts and snow drifts 2 to 3 feet or more. September through April is primary season for significant snowfalls, with December/January producing colder and dryer snow storms and March/April producing wet and heavy snowfall. On average Adams County receives anywhere from 58 to 112 inches of snowfall annually. Primary impact of severe winter weather is on travelers using the interstate highways (25, 76, 270 and 70), state highways (36, 85, 2, 79 and 7) and the airports. Since 1993, Adams County has experienced 57 winter weather events as recorded by NCDC. 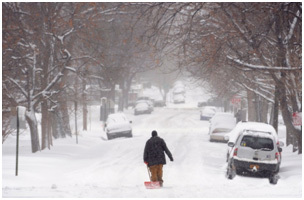 Heavy winter storms affecting the metropolitan area occurred in 1913, 1982, 1997, 2003, and 2006. Winter storms occur in many forms and can vary significantly in size, strength, intensity, duration and impact. They can bring snow, sleet and freezing rain, or a mix of these wintry forms of precipitation. 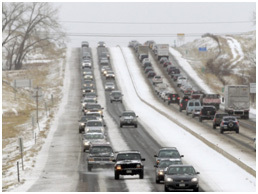 Most injuries during winter storms are caused by transportation accidents, residents slipping on ice and hypothermia. When ice accumulates on roadways and walkways, the risk of losing traction becomes much greater. Snow accumulation at any level is also dangerous. Heavy snow loads have caused roofs to collapse and, when combined with freezing temperatures and early spring rains, such storms can bring down power lines. Secondary dangers from winter storms include carbon monoxide poisoning and house fires from improper use of alternative heating. Other issues caused by winter storms can be related to school closures, business closures, road closures, snow removal and maintaining critical services like emergency services, food providers and banks. The primary concerns for winter storms is the ability to knock out heat, power and communications services to your home or office, sometimes for days at a time. Extended power outages from ice storms will require supplemental heat and electrical sources. It is important to be prepared for winter weather before it strikes! Before winter approaches, update or add supplies to your emergency kit as well as a supplies kit in your vehicle. Rock salt or more environmentally safe products to melt ice on walkways. Visit the Environmental Protection Agency for a complete list of recommended products. Sufficient heating fuel. You may become isolated in your home and regular fuel sources may be cut off. Store a good supply of dry, seasoned wood for your fireplace or wood-burning stove and clothing and blankets to keep you warm. Make a Family Communications Plan. Your family may not be together when disaster strikes, so it is important to know how you will contact one another, how you will get back together and what you will do in case of an emergency. Listen to a NOAA Weather Radio or other local news channels for critical information from the National Weather Service (NWS). Be alert to changing weather conditions. Bring pets/companion animals inside during winter weather. Move other animals or livestock to sheltered areas with non-frozen drinking water. Drive only if it is absolutely necessary. If you must drive: travel in the day; don’t travel alone; keep others informed of your schedule; stay on main roads and avoid shortcuts. Stay indoors during the storm but if outside walk carefully on snowy, icy, walkways. Snow and Ice traction supports can be bought at low cost to fit over most shoes and boots to aid in walking. Avoid overexertion when shoveling snow. Overexertion can bring on a heart attack—a major cause of death in the winter. If you must shovel snow, stretch before hand. Keep dry. Change wet clothing frequently to prevent a loss of body heat. Watch for signs of frostbite. These include loss of feeling and white or pale appearance in extremities such as fingers, toes, ear lobes, and the tip of the nose. If symptoms are detected, get medical help immediately. Watch for signs of hypothermia. These include uncontrollable shivering, memory loss, disorientation, incoherence, slurred speech, drowsiness and apparent exhaustion. If symptoms of hypothermia are detected, get the victim to a warm location, remove wet clothing, warm the center of the body first and give warm, non-alcoholic beverages if the victim is conscious. Get medical help as soon as possible. Maintain ventilation when using kerosene heaters to avoid build-up of toxic fumes. Refuel kerosene heaters outside and keep them at least three feet from flammable objects. Conserve fuel, if necessary, by keeping your residence cooler than normal. Temporarily close off heat to unused rooms. Continue to protect yourself from frostbite and hypothermia by wearing warm, loose-fitting, lightweight clothing in several layers. Stay indoors, if possible. Be careful shoveling snow, moving around; look out for downed wiring or broken tree branches; check on your neighbors, especially those with access and functional needs. Go back and replace the supplies you used in your emergency kit. Ice Storm Warning is issued when a period of freezing rain is expected to produce ice accumulations of 1/4" or greater, or cause significant disruptions to travel or utilities. Heavy Sleet Warning is issued when a period of sleet is expected to produce ice accumulations of 1" or greater, or cause significant disruptions to travel or utilities. Heavy Snow Warning is issued when snow is expected to accumulate 4 inches or more in 12 hours, or 6 inches or more in 24 hours. Winter Storm Warning is issued for a winter weather event in which there is more than one hazard present, and one of the warning criteria listed above is expected to be met. Blizzard Warning is issued for sustained wind or frequent gusts greater than or equal to 35 mph accompanied by falling and/or blowing snow, frequently reducing visibility to less than 1/4 mile for three hours or more. Watches are issued when conditions may be met 12 to 48 hours in the future. To see the full list of disaster preparedness tips for winter storms, visit, www.ready.gov/winter-weather. Our Mission: To responsibly serve the Adams County community with integrity and innovation.